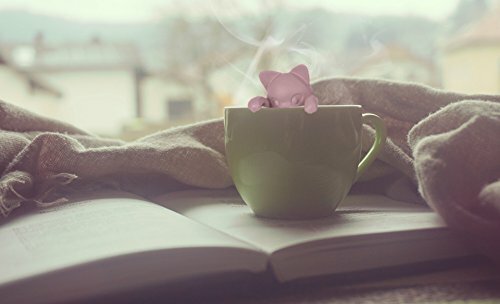 Who wouldn’t love the appeal of an adorable cute tea infuser? 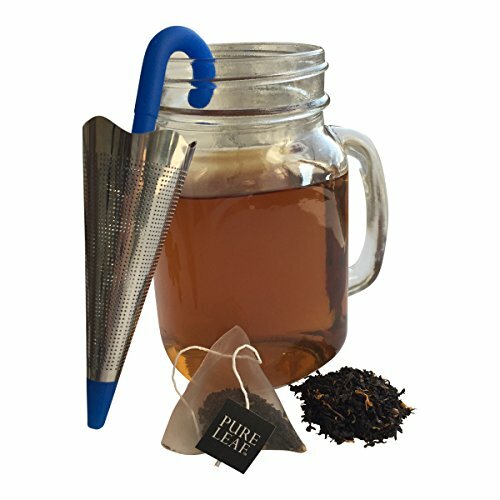 If you are looking for a special gift for a tea or coffee lover in your life, this list of unique tea infusers has got you covered. 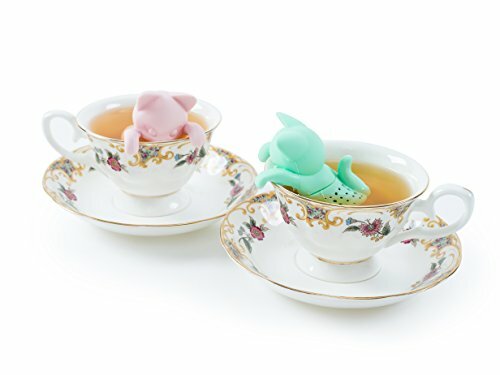 Combine these infusers with a cute tea mug and you have a conversation starter. 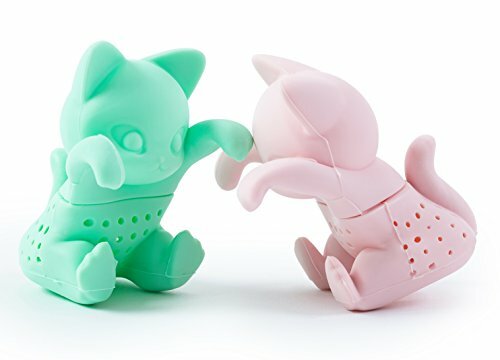 Mr. and Mrs. Kit-Tea infusers are made of high-quality, durable, food-safe FDA approved and BPA free silicone. 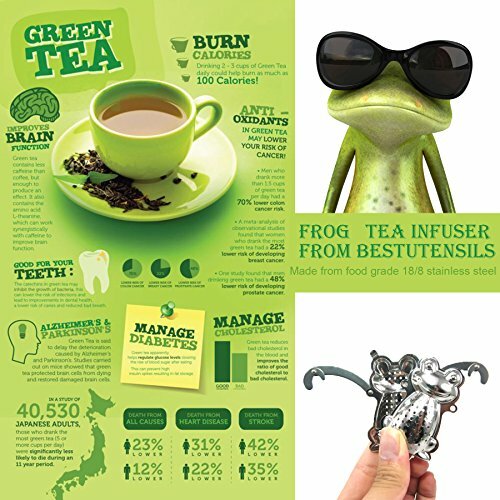 They are super easy to use: simply pop off their bottom and fill them with high-quality loose leaf tea, place them in a mug with hot water and stir to infuse. 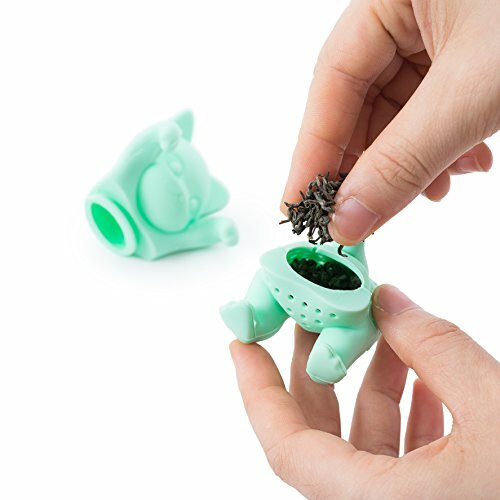 These tea strainers have fine holes to prevent leaf bits from escaping. 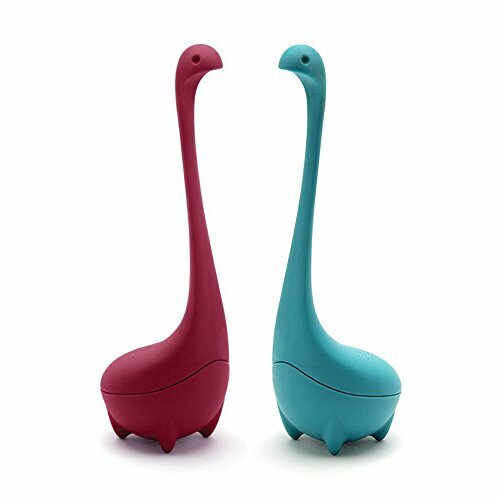 They are a great gift set for couples, dinner parties, Christmas stuffer, anniversaries or housewarming parties. 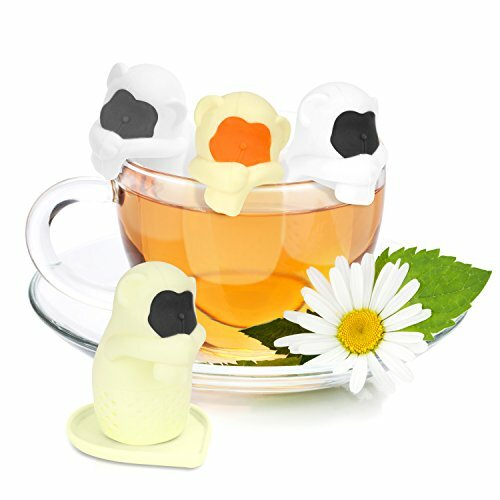 Silicone material used to make the tea infuser is rust-resistance and does not discolor or add an unpleasant taste to your tea. 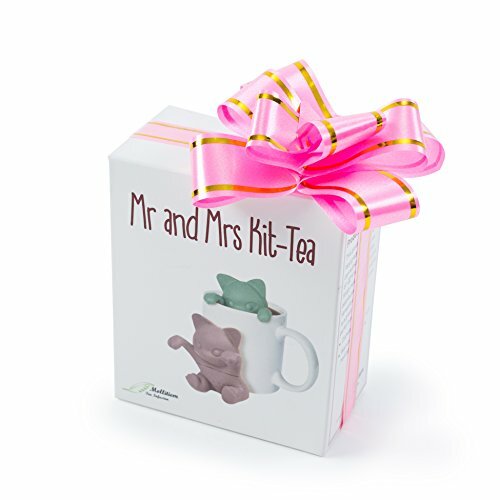 Mr. and Mrs. Kit-Tea infuser by Millitiem comes with a lifetime warranty. If your infuser is broken or not functioning, you can have it replaced free of charge at any given time. 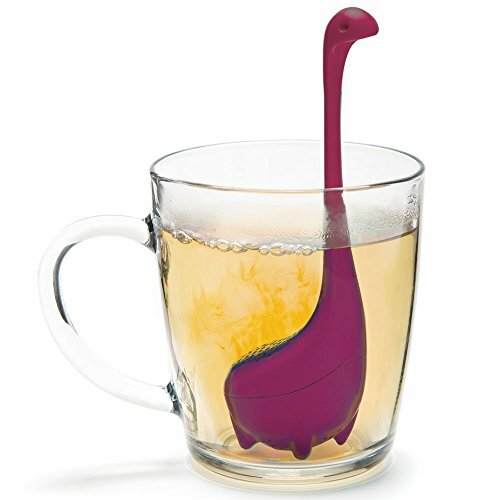 Baby Nessie loose leaf tea infuser is perfect for brewing a single cup of tea. 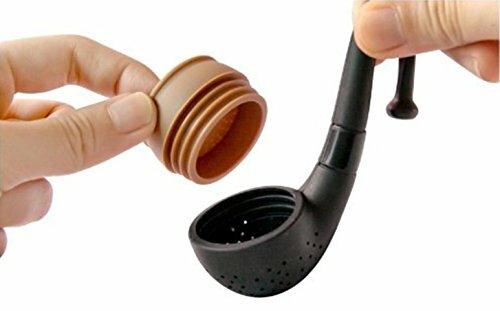 This tea infuser is easy to load. All you have to do fill the bottom half with loose leaf tea and push the top to the bottom and steep to your desired tea strength. 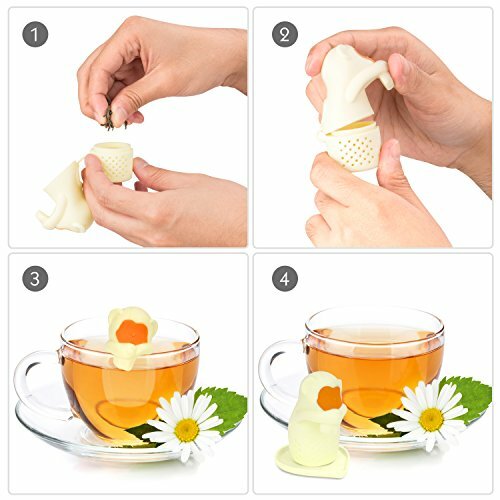 The infuser sits flat in your cup to brew you a cup of tea in seconds. 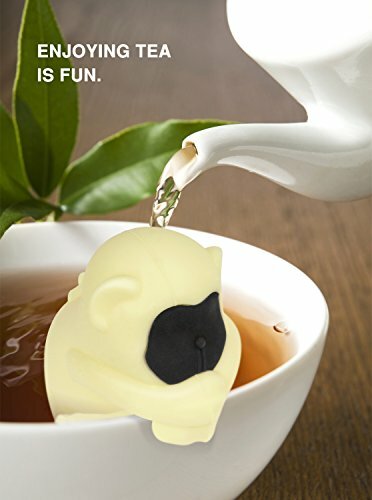 Tygate tea infusers are made from eco-friendly and reusable 100% BPA free silicone. 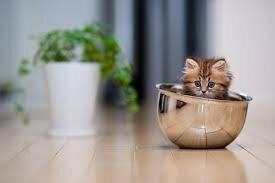 This material is dish-wash and microwave safe. 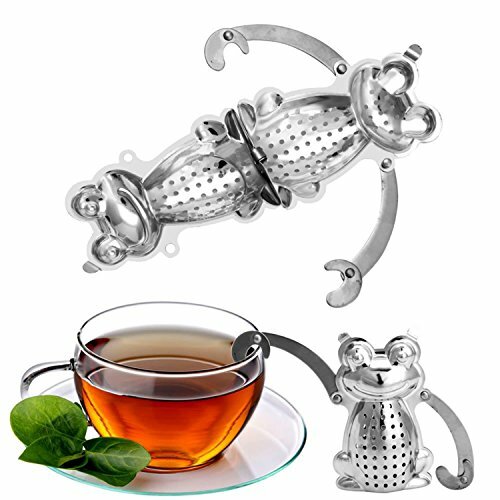 These infusers are designed to withstand temperatures between -22 to 450 degrees Celsius. 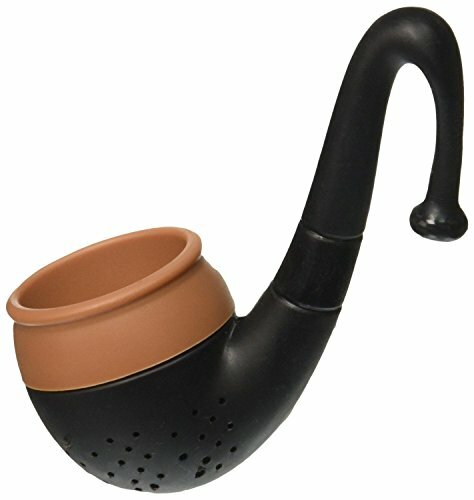 Easy To Use: Simply fill the bottom half with the tea of your choice. Give the top a quick push to the bottom and let it steep. 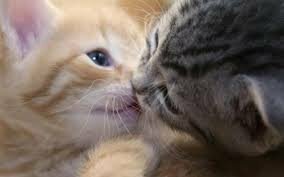 That's it ! 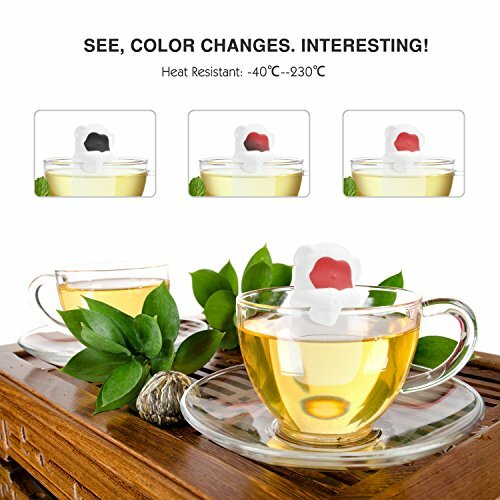 Eco-Friendly & Reusable: Save With Food Grade FDA,SGS,LFGB Certified Pure Silicone , Can withstand temperatures from -22 degrees F to 450 degrees F.
This is a 4 piece tea infuser set made from 100% food grade FDA approved silicone to make it odorless and non-toxic. The infusers are designed to withstand temperatures from -40 to 230 degree Celsius to ensure they do not deform due to high heat. 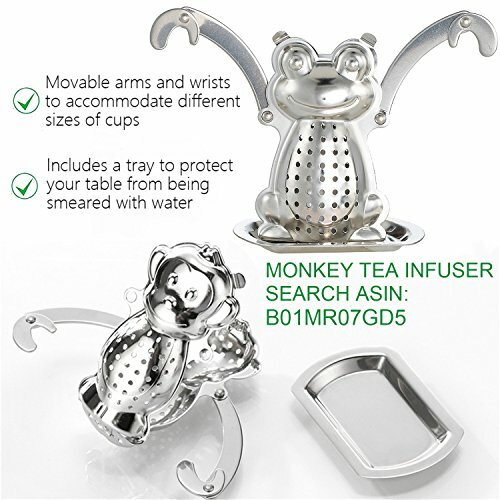 To use the infusers, squeeze the belly of the monkey to detach the top half, fill it with loose leaf tea, place it in a mug and add hot water. 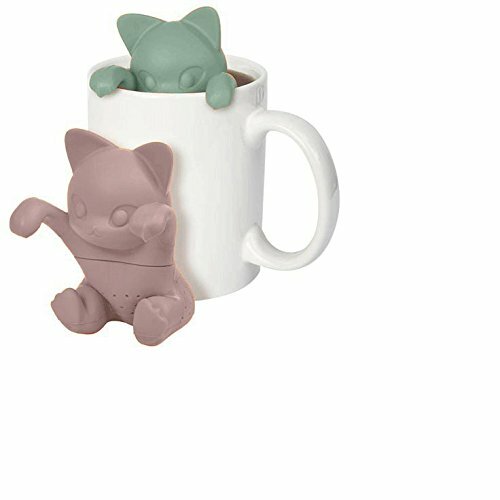 The baby monkeys rest on the edge of the cup and their faces change color when the temperature of the brewing tea reaches 80 degree Celsius. 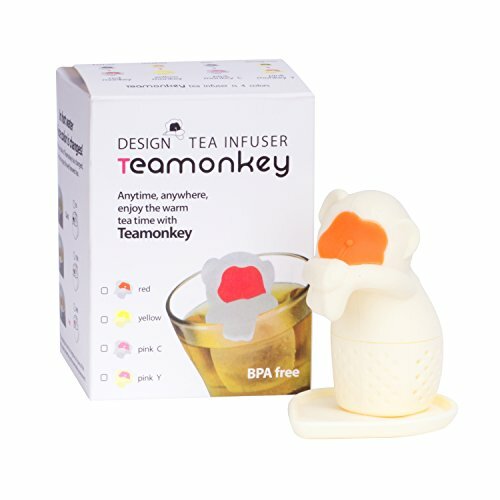 These baby monkey infusers have small round holes to reduce floats and prevent leaf debris from escaping. 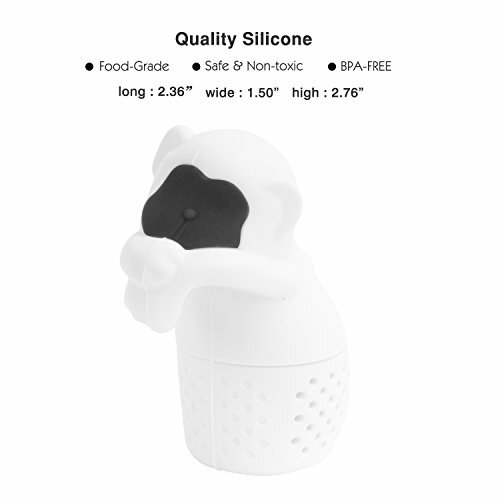 Four silicone drip trays are included to store your used baby monkey infusers. 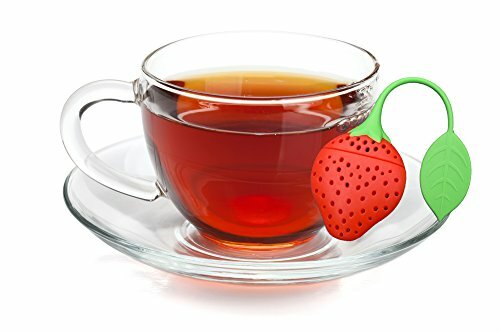 PREMIUM MATERIAL AND SAFE: Made from 100% food grade FDA approved soft silicone, this tea infuser set is odorless and non-toxic. 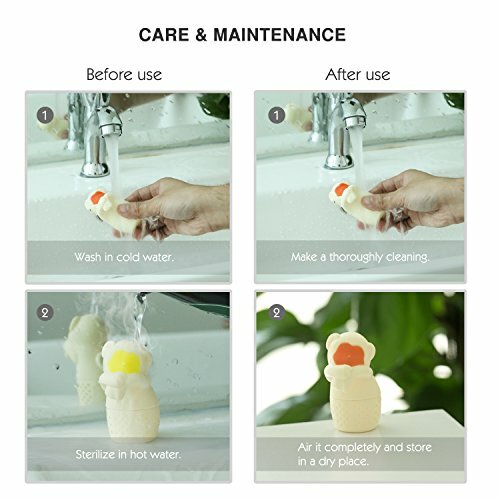 HIGH TEMPERATURE RESISTANCE: Withstand temperatures from -40 ℃ to 230 ℃ (-40 ℉ to 446 ℉), so they can protect your fingers from heating up and scald. Super strong flexibility ensures no deformation and fracture. 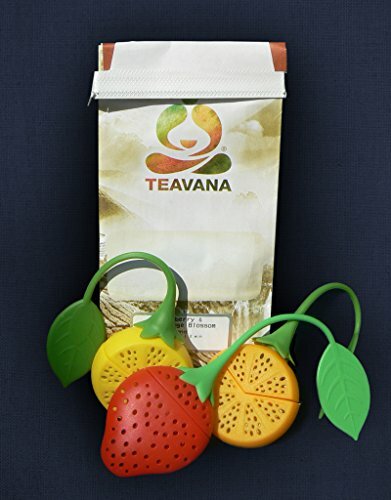 This set of fruit tea infusers includes a strawberry infuser for course ground tea and orange and lemon infuser for fine tea. 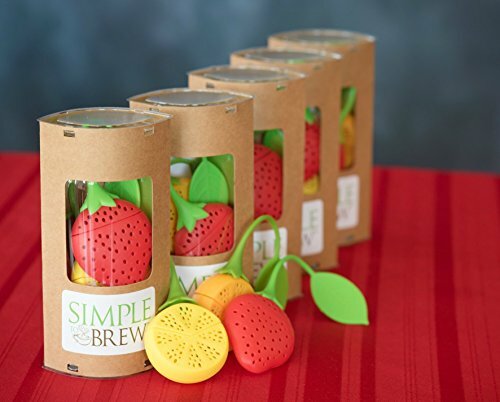 The infusers are made from BPA free, food grade silicone. 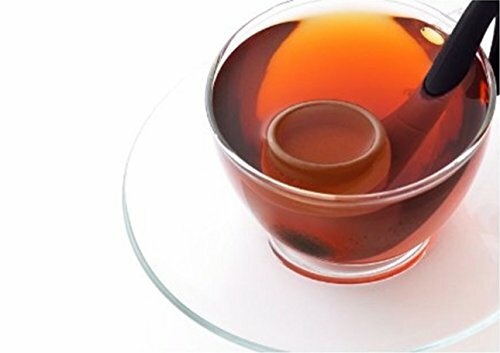 To steep your mug of tea, simply separate the infuser into two parts, spoon your tea leaves into the bottom of the infuser and gently push it back together. 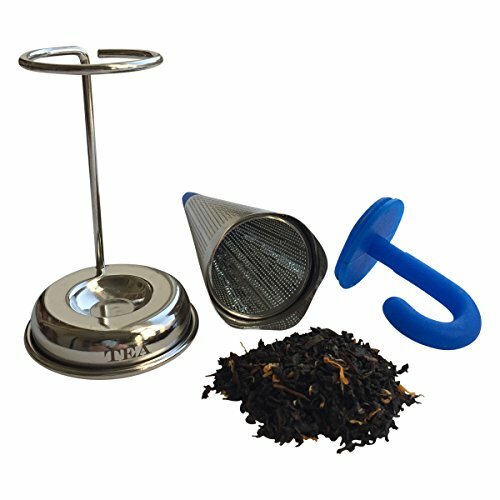 The infusers come in a unique package and a how-to-brew guide which makes them a perfect gift for tea lovers. 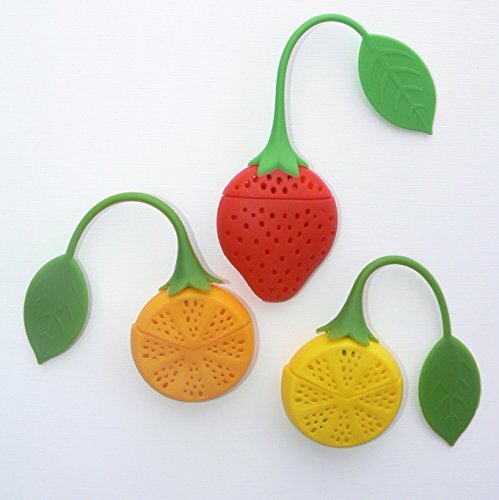 The color of the fruit tea infusers are vibrant and will look great in your kitchen. 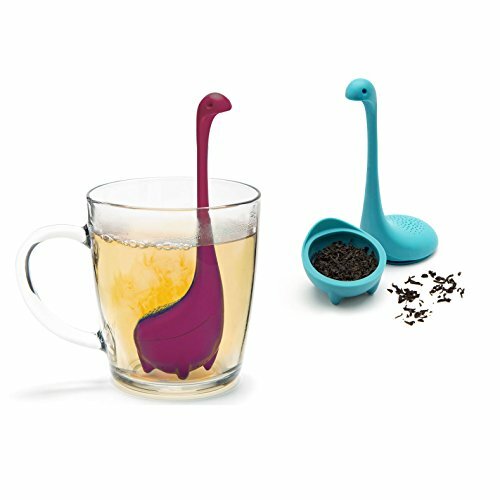 They have long handles to allow you brew your tea in mugs of different sizes. 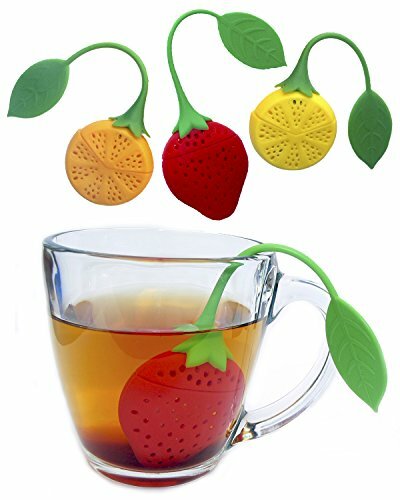 These infusers have fine holes to steep any loose leaf tea and reduce floats. 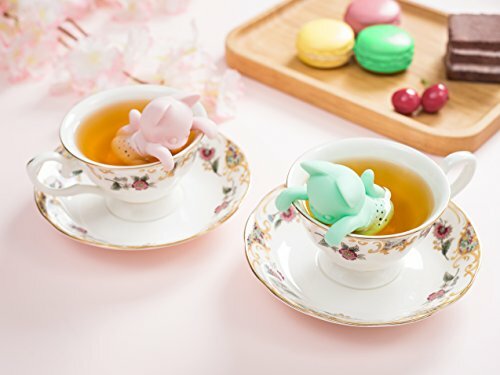 Make tea time more fun with adorable loose leaf tea infusers! 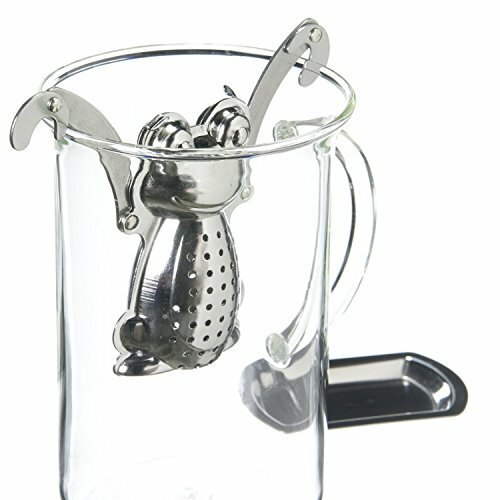 Simply spoon your tea leaves into the bottom of the infuser, push together and begin steeping your mug of tea. 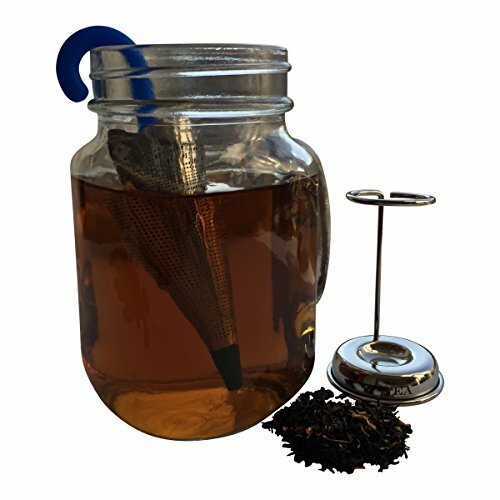 Infusers come in a unique package ready for gifting and with a how-to brew guide. 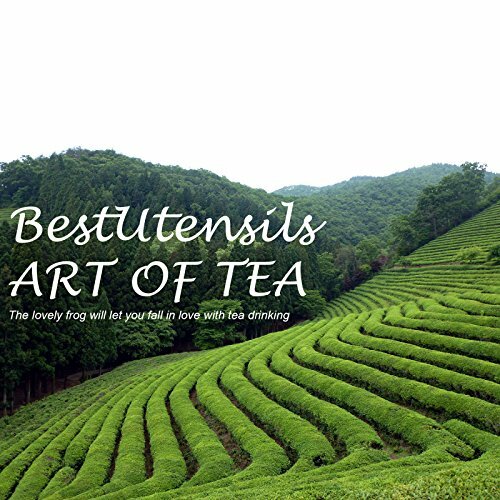 This tea set makes a great gift for tea lovers, and is great for occasions like birthdays or a hostess or housewarming gift. 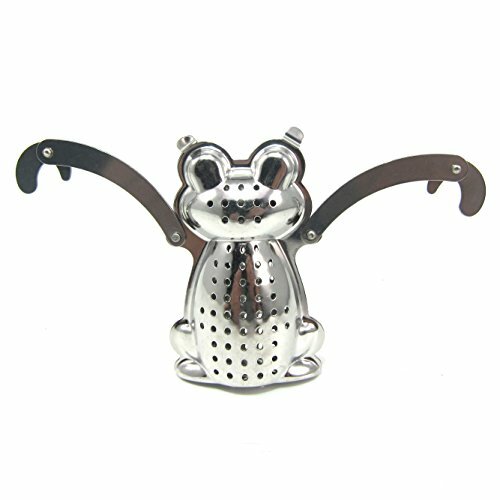 This unique frog infuser is made from high quality, durable, eco-friendly and food grade stainless steel. It has an elegant mirror finish. The infuser is fitted with extra fine mesh to ensure debris do not steep through. It is a perfect gift for any occasion: wedding, housewarming, and birthdays. 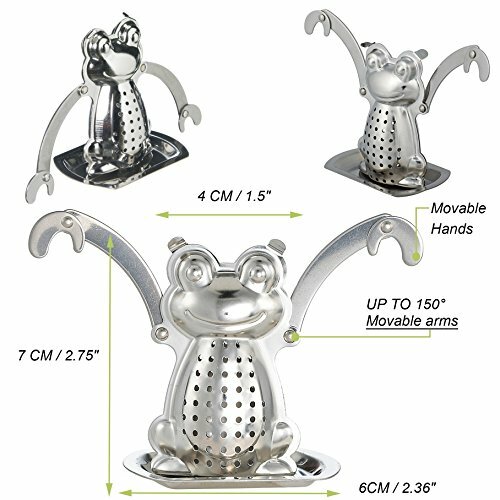 This frog strainer has two buttons to move it in different directions and two movable arms and hands to fit mugs of different sizes. The infuser also comes with a drip tray to help keep the surrounding area clean. DURABILITY & SAFETY: Do not compromise with anything less than perfection when it comes to your Kitchen utensils & gadgets. 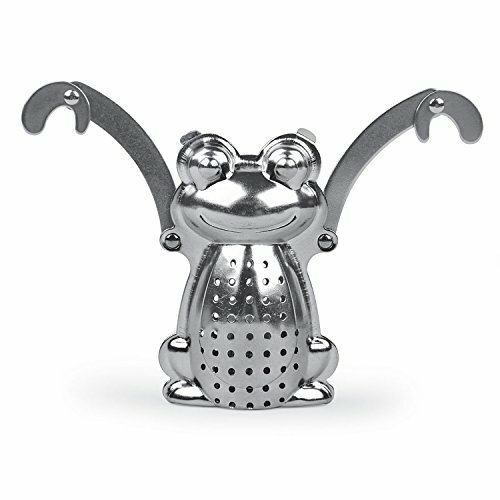 This frog infuser has a unique and elegant mirror-finish. Made from high quality, durable, eco-friendly and food grade 18/8 stainless steel materials to meet the people's growing health standards and assure unmatched longevity. 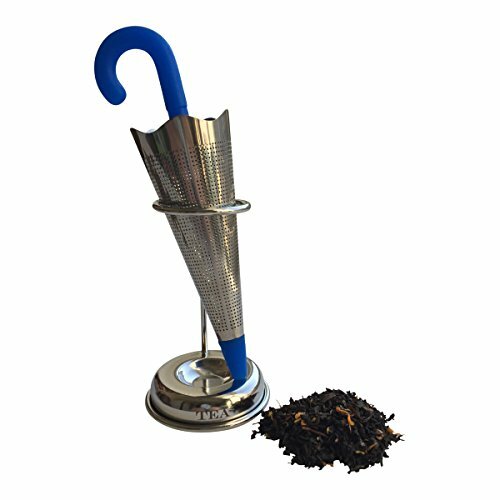 This is a unique and adorable stainless steel tea infuser umbrella. 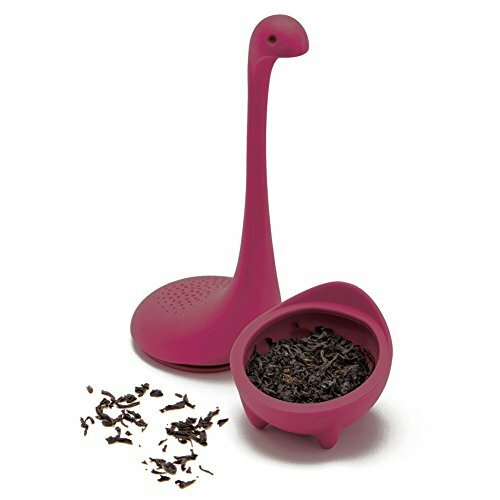 It comes with a heat resistant silicone lid etched with the word “Tea” on its base. The infuser can brew loose leaf tea, tea bags, herbs and coarse coffee grounds. 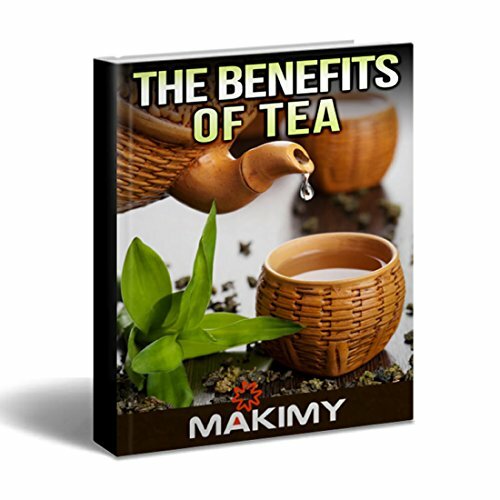 It is durable and user-friendly: simply remove the lid, fill with your favorite loose tea and steep in hot water for 2-3 minutes. 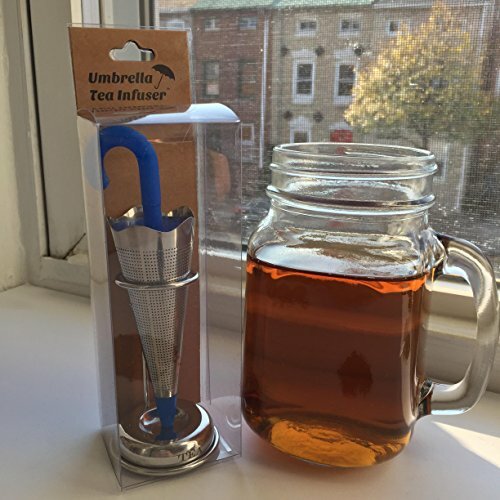 The infuser fits perfectly on the mug and keeps the tea leaves inside to make the perfect cup. It includes an umbrella stand for storing the infuser and to create a super cute display in your kitchen. 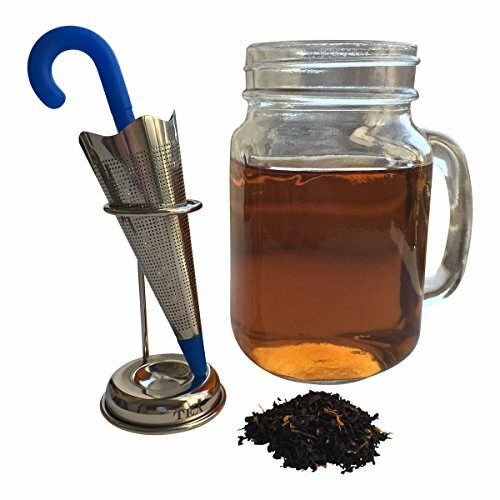 The umbrella infuser comes in a gift-ready package and is a great treat for tea and coffee lovers. 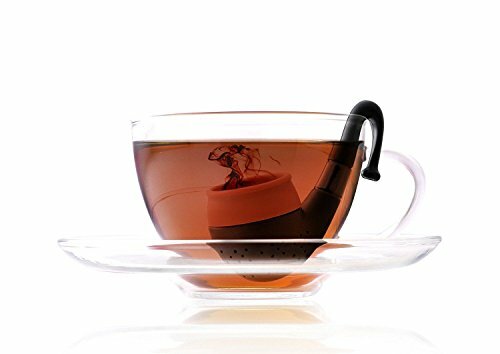 This smoke shaped tea infuser is molded from food-safe soft silicone rubber which is easy to clean, dish-wash safe and BPA free. Its holes are fine to prevent debris from escaping. 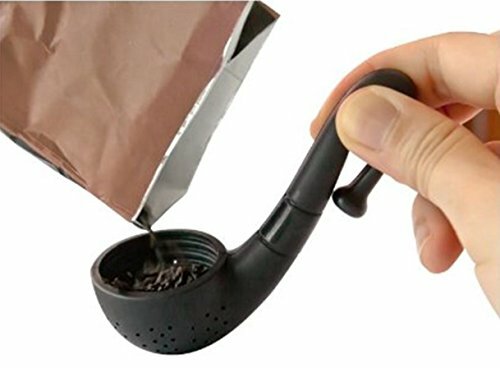 The pipe sits right along the rim of any standard sized cup or mug to make a perfect brew. 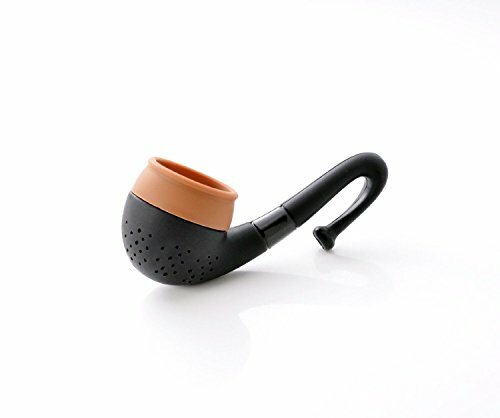 This pipe infuser is black and brown in color and it comes in a cute plastic container so it can be a great gift for father’s day. 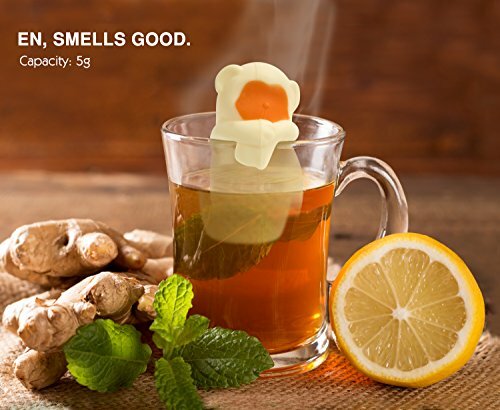 This clover tea infuser is crafted from high-quality stainless steel and FDA approved food grade silicone. It has the shape of a gift box. The three clover basket cap has very fine holes to ensure debris do not pass through to your tea. The infuser comes with a three clover hook so you can safely pull it out of the mug without burning your fingers. 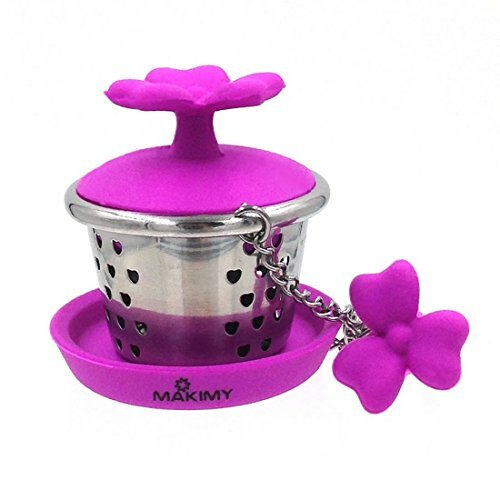 A magenta drip tray is included to rest your used infuser. It matches the clover hook to create a beautiful display in your kitchen. 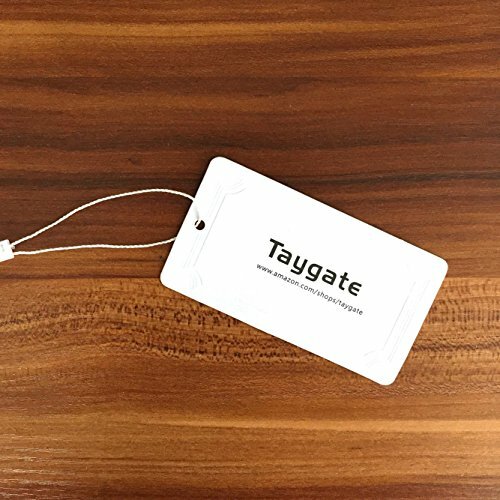 ✔︎ MAKES A GREAT GIFT! 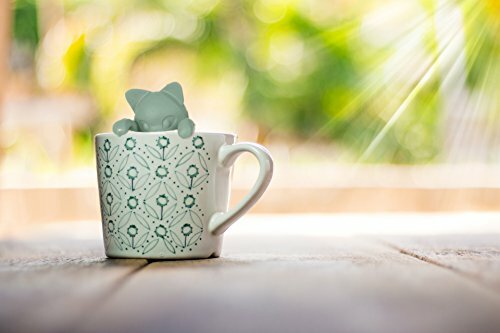 The adorable clover design makes this tea infuser a great gift for the tea lover in your life. 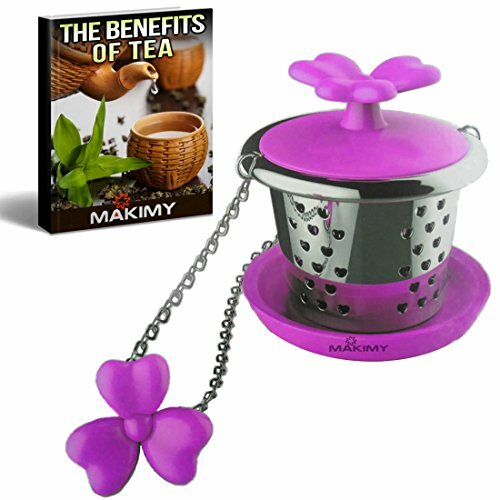 Who wouldn't love the appeal of a cute purple three-leaf clover for their tea infuser? 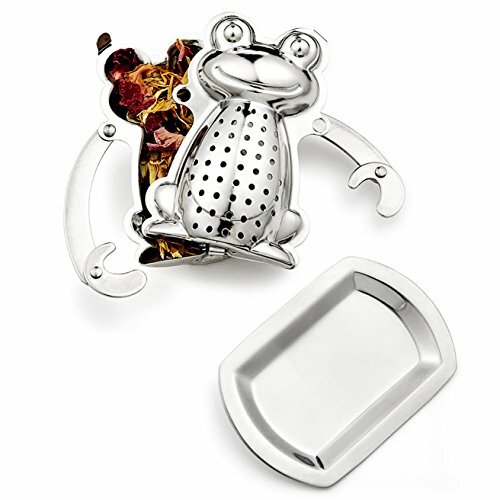 Combine this infuser with a cute tea mug and their favorite tea and you have the perfect gift. 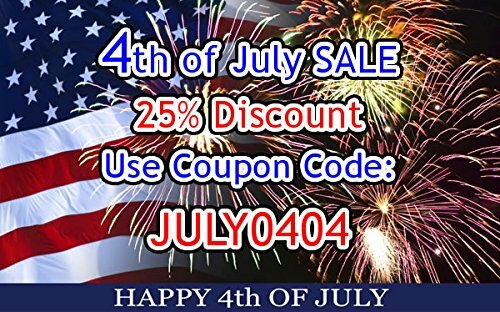 Don't forget to buy one for yourself too - you get a discount when you purchase two or more.